G’day. Welcome to my TV Antenna Installation site. For TV aerials and Antennas in and around Perth, we are the local experts. If your television reception has gotten worse, it may not be the fault of your television. It may be that your roof antenna is damaged or not up to the specification required to receive signals of sufficient strength. Many homes in Perth are located in valleys that can restrict the level of TV signals received. 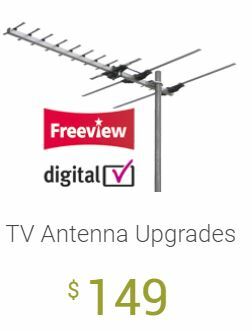 It may also be the case that storms, strong winds or simply years of weathering have rendered your existing TV antenna useless and in need of replacement. We can assess your antenna needs and install a modern digital TV ready antenna to ensure you get the best possible picture on your television. Also, we can also install additional television antenna outlets in other rooms throughout your home. We use a wide range of high definition digital ready HD antennas, depending on the area or need. All of our high-quality antennas are Australian made, and supplied by Australian companies including Hills, Matchmaster and Electrocraft. Our products are Australian rated and made for our conditions. They also come with a 10-year warranty and my personal guarantee. WE DO NOT RECOMMEND OR USE CHEAP IMPORTED CRAP ANTENNAS!! They will waste your time & money and break under our harsh weather conditions and baking hot sun. For long-term digital TV reception, Aussie made equipment is the only way to go. Here at TV Antennas Perth, we are government endorsed antenna installers with many years of experience. We have all the latest equipment needed for digital TV testing and the health and safety training as well as the insurance to safely get on your roof. Chat with me online now for a free quote or some free local TV reception advice. We can explore the best TV antenna installation, its cost and a TV aerial install that suits you best.